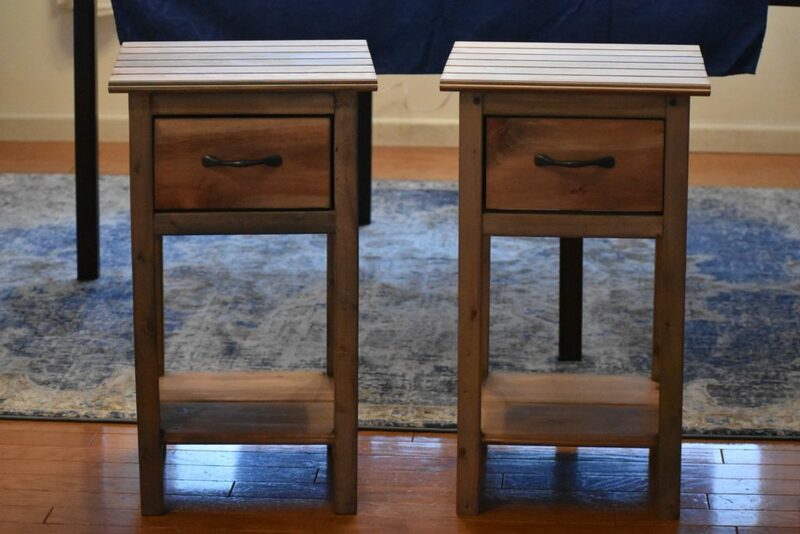 As I mentioned in a prior post, I built two nightstands. I built them mostly by myself, once Tim helped me get started.I am really proud of myself and I learned a lot through these builds. 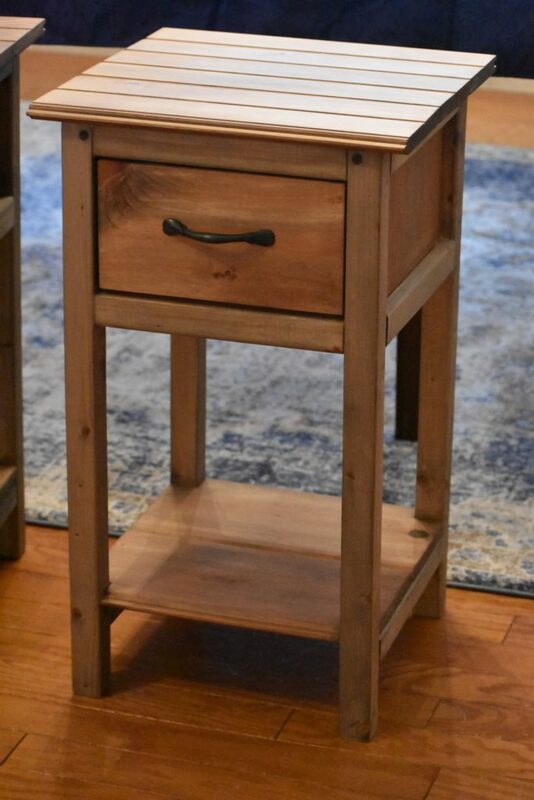 I used Ana White’s Mini Farmhouse Bedside Table plan with some modifications. Some of this is repeat from the previous nightstand post, so feel free to skip if you read that one. I used 1×6 tongue and groove for the tops because this is what we used on the headboard and I wanted it to match. We used 1×8 tongue and groove, smooth side up, for the bottom shelves. If you viewed the original plan, you would see that there was a board set in between the horizontal supports. I just didn’t think that it would match the look I wanted. I probably could have used the jig saw on the originally called for shelf boards to set them on top of the horizontal supports, like I did with the the tongue and groove, but I’m really happy with it this way. I used the same Weatherwash PINED stain, Clear Maintenance Oil, and Flat Varnish that I used on the bed frame. The color is beautiful. 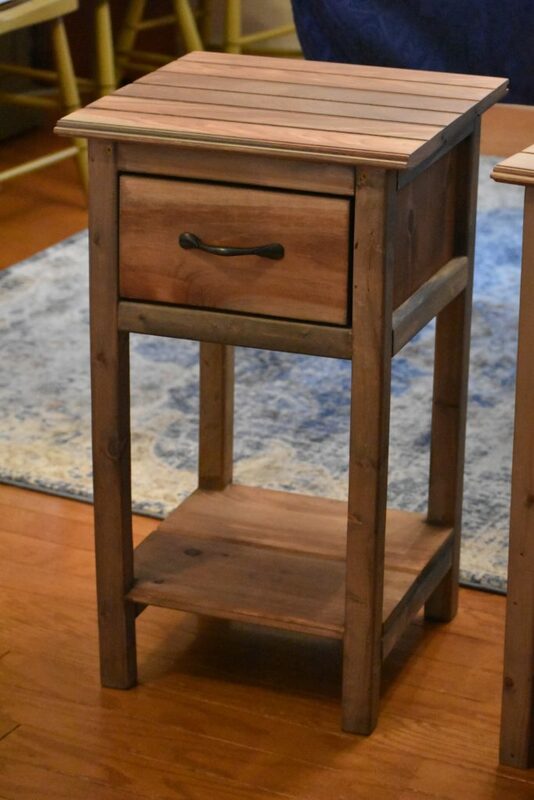 The second one came out richer/darker, which could be from using a new can of stain, or variations in the wood we purchased. I love them both! Here are some finished pictures I took with the fancy camera. The only thing I’m pondering about doing differently with my next build, is staining before assembling. Even having a tiny brush nearby didn’t make me feel like I could get stain into all of the joint areas. This may be because not all of my joints are dead on. So, assuming I improve in that area, it wouldn’t be an issue in the future. I think I’ll try it anyway. This entry was posted in Empty Nest, Hobby Adventures, House Projects, Making Stuff With Wood and tagged Ana White DIY, building with hubby, empty nest life, hobby adventures, house projects, making stuff with wood, mini farmhouse bedside tables, playing with the fancy camera, taught them to fly, weatherwash by Mara. Bookmark the permalink. These are absolutely amazing. All of your joints and seams are perfect. Your learning curve on your “hobby” has been a super acute incline! Thank you, for your continued support, in so many ways!